Personal records aren’t just for elite runners. Even the most adamant of competition-averse health and fitness runners can, with enough prodding, give you their PR time (or an approximation) at a given distance or over a given course. At the very least, they’ll remember when they ran that neighborhood course and everything came together just right: when they and the temperature, humidity, wind and traffic were on the same page; when they were able to wring just a little more sweat from their body and a little more oomph from their will; and when the music on their iPod or the encouragement of their training partner was just what they needed without being too much. They’ll remember thinking that had they been wearing a watch, that watch would have given a favorable report. They’ll acknowledge still not having been fast enough to best most serious runners. But on that special day they’ll remember having been fast enough to best themselves, which for most of us is the point. So what’s the big aversion many runners have–at least publicly–to chasing PRs (or even claiming to know theirs)? How did these two innocent letters earn such a seedy reputation among fitness-running purists? To establish one’s benchmark, and then to surpass it can be character-building. It’s not often one gets to objectively measure one’s advancement in their play. Of course, some argue that statistics are best left to statisticians, and that our play should be as unfettered as nature intended it. I see it differently. The discovery of a primitive counting app, the Ishango Bone, suggests that humans have been counting stuff for at least 20,000 years; counting looks no less natural to anthropologists than running. And speaking of natural, seeing how long one can bear discomfort is central to more rites of passage than one can shake a notched stick at; testing one’s meddle is a primal urge. What child hasn’t some time or another counted how long he could hold his breath, making such playful masochism the sport of a summer hour among friends? We love counting. And we love suffering (the character-building kind, any way). It makes perfect sense that we should love counting the minutes and seconds of our suffering. Is it any wonder then that many runners go through a stage where the PR becomes an unrelenting quest? Sure, the idea is to get the suffering over in as few seconds as possible, which can only be accomplished by packing more suffering into each second. Doesn’t it make you want to go out and PR right now? A runner on a PR quest will stop at nothing to recruit everything and everyone to his monomaniacal cause, setting some arbitrary goal (i.e., a sub-3 hour marathon, a sub-20 minute 5k) and then pursuing it from course to course like Ahab pursuing the white whale through all the seven seas. Speedwork follows. Training partners are recruited. Track clubs are joined. Coaches are sought. Books and magazines are read. Diets are adhered to. Racing flats are broken in. Clothes are shed (except the essentials). Hair may even be cropped closely in the reductionist’s quest for the sleekest lines. In short, a PR seeker will have done everything to ready herself for a PR bid. She’s in peak condition. Time to strike. While a PR isn’t guaranteed, it’s probably just a matter of course–quite literally. Think about it. 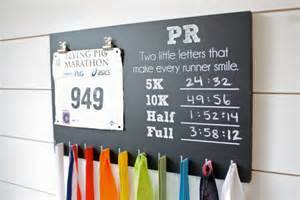 A PR is an event that requires a runner and–here’s the thing (apart from time with family and friends) that often gets lost in all the minutiae –a course. Choosing the course that will yield a PR before one’s peak fitness window closes, is an art one can’t afford to neglect. Here are some pointers that most veteran PR chasers will have committed to memory. Most of us will have learned all of this the hard way, having tallied far more personal realizations (regrets?) than personal records. Make sure the course is certified. Obviously one doesn’t want to run a long course when chasing a PR. Less obviously, one doesn’t want to run a short course. Nothing takes the wind out of a PR quicker than the niggling chatter of post-race, GPS-aided speculation that a course was short. Certification by a governing body is necessary to ensure an accurate distance. And even then there’s no guarantee. I once ran a “certified” course that ended up being a tenth of a mile short owing to an honest mistake made by a single race marshal. Extrapolating what one’s finishing time would have been isn’t nearly as fun as gloating over one’s actual PR time. As a PR chaser, it will behoove you to find, if possible, a standard certified course on which races are frequently run, and to use that as your proving grounds. Make sure the course has a neutral elevation gain. Net downhill courses, while they are often accepted as qualifiers for entrance into subsequent races or race waves, carry the stigma of an asterisk. Make sure the course is as flat as possible. While it is true that what goes up must come down, even the presence of gently rolling hills may have a negative effect on one’s PR bid. Failing that, choose the course that plays to your personal strengths. I’ve discovered repeatedly that courses that begin downhill and finish uphill augment my natural tendency to go out fast and fade toward the end. I’ve always PRd by positively splitting on courses that encouraged positive splitting. You may be fortunate enough to PR the prescribed way: by negatively splitting. Make sure the course is at the lowest elevation you can find. Training high and racing low may not be in most of our budgets. However, if one lives in a region where considerable elevation differences exist (such as the Colorado Front Range), it behooves one to train in the foothills and race in the cities and river valleys. Choose a course with a fast surface. Trailrunning is out when it comes to an all-out PR. Concrete and asphalt surfaces are the fastest. Even groomed gravel is a relatively slow surface. Choose a course with few twists and turns. Wide loops and point-to-points are the best. Out-and-back courses with tight turn-arounds take seconds off one’s bid. Each tight corner makes it a bit more difficult to turn in a PR performance. Additionally, when trying to set a PR it is a good thing to be able to see who is in front of one. One wants to see that runner up ahead, focus on him and take heart while experiencing the thrill of steadily reeling him in. If one keeps loosing sight of him behind blind corners and stands of trees, one just might loose contact with him and with one’s PR pace. And while this may have more to do with the race than the course, I’ll throw it out there anyway: choose a race where you are likely to find talent slightly above your level, giving you the advantage that being pulled or pushed along can confer. Choose a well-marked course. Ambiguities require energy and time to resolve on the run. One wrong turn and one’s PR bid is blown. Narrow courses are to be avoided. Say our PR chaser gets stuck behind a pack of slower runners running three abreast or even one runner with a stroller: she is loosing precious seconds while getting frustrated. Every second spent running someone else’s race is a second spent out-of-sync with one’s most efficient pace. Chip timing is essential unless one is willing to toe the line with the front runners. Without chip timing one may start the timer on his sports watch the second he steps over the starting line, but his official time will add every second it took him to get to the starting line. “I ran even three seconds faster than my PR,” may be a true statement, but the results page is the final word. Choose a course that avoids wind. Loops and out-and-back courses usually avoid the trouble of running with or against a prevailing wind. Running into a wind kills a PR bid. Running with a tailwind results in an asterisk. Not only are they a bit difficult to pronounce; they’re a bit difficult to live with. As long as one’s running doesn’t become all about chasing PRs all the time (don’t be that guy), a little PR chasing might be just the thing one’s running needs to jolt it out of the doldrums. Like most rational adults, you’ve probably figured out that as far as the world is concerned, your half marathon PR will mean little. But that shouldn’t stop your inner child from acting as if your PR meant the world. Family, friends, and bosses may chafe at your weekend-warrior quest. I say PR now, and ask for forgiveness later. Running is an English verb. Running is also an English noun, a gerund. As a gerund, running refers to the subculture consisting of every person who identifies him or herself as a runner or, gulp, a jogger, and every activity associated with the verbs running and jogging, including their countless mash-ups with marketing, sports apparel, sports gadgetry, sports medicine, sports psychology, magazines, books, and blogs. To say that running refers to a lot doesn’t begin to cut it. Running is a jungle. Like the word running, the word jungle is loaded with meaning. Apart from representing a specific kind of habitat, jungle denotes the following: 1.) Any confused mass or agglomeration of objects; jumble. 2.) Something that baffles or perplexes; maze. 3.) A scene of violence and struggle for survival. 4.) A place or situation of ruthless competition. If the metaphor fits, lace it up. Running wasn’t built on the plan of a single master architect. There is no father of running, Pheidippides notwithstanding. Running did, however, have a primordial mother. Her name was necessity. Before there were settled communities, man sometimes ran from trouble and for his dinner. He sometimes ran on the battlefield. He sometimes still does. Running for sport didn’t properly begin until man no longer–as a rule–needed to run. That men and women are actually running more when there is less apparent need than ever is a phenomenon worthy of contemplation; it is the very thing that non runners find weird about running. Jack London, author of The Call of the Wild, believed that the code of one’s ancestral appetites and capacities is saved in a kind of system restore file in the brain. By “going back into the womb of time,” or heeding the call, London believed it possible to unzip this file and run its script. London’s “science” was at best dubious, but it is still intriguing to think that the fun run one finished last month may have involved digging in the survival tool kit of a remote uncle stalking a Kudu or a deer. “Thought I heard a rumbling/calling to my name,” sings John Fogerty in the song for which this article is named. Eleven million American runners make quite a rumble, indeed. Running is a curious mishmash of survival equipment and leisure pastime. With few exceptions, people today don’t actually need to run. So are the rest doing it just for fun? At every race and in every neighborhood, one can observe someone who is running yet obviously not having fun. And not every one of these folks is under doctor’s orders. Running is as complicated as one might expect of something that grew at hazard along with cultures that are themselves unplanned agglomerations, jumbles of incongruous institutions sometimes at odds with one another. Running too is a jumble as well as a jungle. Just as the jungle is home to a staggering range of biodiversity, so is the modern running jungle; it shows no more regard for national, political and religious boundary lines than do the most expansive jungles on the planet. A man can run in all manner of headdress and in all manner of costume and with whatever ideas knocking about his head. Our various ideas all weigh the same, and disadvantage none. One’s formal education or lack thereof count for nothing in the running jungle. Until recently, running was said to be a poor man’s sport. The first running boom abounded with fringe eccentrics, survivalists, and George-Sheehan-esque cheapskates who balked at shelling out $40.00 every three months for a pair of running shoes and who raised a racket when a race began charging an admission. Today, not so much. The second and third running booms have drawn the affluent into our realms: the safari crowd. A skilled tracker can tell you all you’ll ever want to know about a runner by his or her running shoe prints alone. In the beginning there wasn’t much to the business: there were waffle-soled tracks that stopped at 6.2 miles (10Ks were once the thing), and waffle-soled tracks that stopped at 26.2 miles. Training distances were “measured” with the precision of a car odometer, or the accuracy of a lace-on pedometer. Nowadays there’s no end to what one sees, from plodding, heavy footfalls that cover 3.1 miles to aggressive-soled tracks that go on and on until our tracker gives up. Under our canopy, there are sometimes tracks in the shape of bare feet; sometimes the floor is littered with colored powder, ticker-tape, and spilled beer; there may even be flaming hurdles, causing a tracker to wonder whether he has been led from the jungle to a circus. Our tracker might also say whether the tracks one makes in the running jungle penetrate no deeper than the periphery, or push on to running’s innermost sanctum. 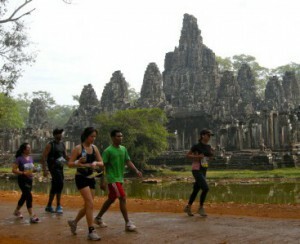 They might suggest whether a runner draws courage from the bustle and din of the villages, the enchanted music of the Khmer temples, or from the stark solitude of realms beyond the compass of the heartiest and most dauntless mail runner. Running resounds with the chatter of riddles, written in hieroglyphs on oozing, mossy walls. They’re sometimes as incomprehensible as zen koans: Train slower to race faster. Run barefoot when your feet hurt. Take walk breaks to “run” a faster marathon. Viewed edge-on and from the outside, jungles belie their enormity. It is the same with running. “I never knew you could have an hour long lecture on running,” a woman remarks of a 55 minute YouTube video on ultrarunning. A greater wonder would be if she gleaned any positive instruction from so brief a primer as that. An hour-long Youtube running video is to running what the Disney Jungle Cruise is to the genuine article. One hears that running is a metaphor for life. This is very different than saying that running is life. Remain too long in the jungle and one may lose perspective, go blind to both the forest and the trees, go native. In very different jungles, the explorers Percy Fawcett and Caballo Blanco embraced similar fates. But most have been less intrepid, or less immoderate, if you like. Read the journals of the great jungle adventurers: observe that they emerged from the jungle at intervals to convalesce and renew their thirst for the jungle. Jungles cover a lot of ground. And so does running. Nevertheless, an atlas offers perspective; however large a jungle one finds in the pages of a Rand McNally, they’ll note that its green expanse is bounded on all sides by other hues, some belonging to the natural palette, some symbolizing the handiwork of man. Our world is far from all jungle. In this age of exoplanets, we may be on the brink of discovering an all-jungle planet, but we’d be certain to wither in its heat, homogeneity, and unremitting peril. Refer to the atlas’s legend if you must; it is a reminder of our world’s variety. Analogously, running must be bounded with what is not running if it is to remain meaningful and not simply run together with all the other humors of life to form an undifferentiated muddy patch, a cartographer’s mistake rather than the art that imitates nature. Colonial hunters returned from the world’s jungles bearing trophies. We runners have our trophies, without ever needing the services of a taxidermist to preserve and to mount them. According to a recent poll on the Website Houzz, the majority of us are accepting of trophies displayed in a single room, though not throughout an entire house. Like a good house, a good life has many rooms devoted to each of the various facets–practical and expressive–of he or she who lays claim to it. The idea is to make running but one of the many rooms in your mansion, however humble that may be. No one ever said it can’t be your favorite room. To riff on a popular marketing meme, personal trainers hate my dog. Which is probably better than anything Caesar Millan would have to say about him. If you’re a dog owner–and why wouldn’t you be?–you may find yourself shaking your head at much of what follows. But if you’re an extreme fitness enthusiast, you’ll have already guessed the silver lining in this story of a boy–ok, a middle-aged boy–and his dog. For me, the intersection between long-distance running and dog ownership stretches back seven years. It started with a border collie named Meg. Then Meg became Meg and Levitt the border-collie combo, tethered both by their affection for one another, and by a double-dog leash. Meg weighed 35 lbs. soaking wet, and Levitt wasn’t a great deal bigger at, maybe, 38 lbs. Those were my salad days. Then came a divorce and the decision to never put asunder what a double-dog leash had joined. The pair stayed with the yard and the ex. Having already taken the double dog dare, one would think I’d have been more than adequately prepared for the challenges of running with one dog. That’s what I thought. And then I met Dakota. Tall, skinny and filthy from weeks of playing roughly in his foster-dad’s back “yard” (actually a sand-lot), I was nevertheless smitten with him from the get-go, though I had to admit that he looked a little mangy and feral, more coyote than McNabb border collie, which is what a dog breeder has since claimed him to be. Since the day we two met, Northern El Paso County’s trails haven’t been safe (at least not for me). A rescue from a New Mexico reservation, Dakota was “one or two years old” when I adopted him. He has since filled out to 60 pounds of strikingly-handsome, muscular, Tasmanian-Devil-spinning badness. Combine the standard border collie’s legendary high energy with a rangy, well-muscled frame bred to herd cattle rather than sheep, add an industrial-strength leash, and what you have is the world’s most portable–or at least most huggable–gym. The Bad Dog Workout offers challenges from the get go. There is no warm-up with this fitness program. With Dakota, at least, every start is a race-pace start; while my bumper sticker may claim that my border collie is smarter than your honor student, I’ll bet your honor student has better pacing sense. To any who happen to be watching us at the outset of a run, he and I might come across as a comedy double act rather than partners in a buddy workout. Mercifully, I’ve never been photographed at the moment of launch. If I were, I suspect the outcome would look something like that photo of me on the Disney roller coaster ride. The Bad Dog Workout offers a special challenge to proper running form: one must remain constantly on guard against the far-forward lean, as well as the exaggerated backward lean, continually engaging the core to maintain equilibrium between the two naturally reactive but errant tendencies. Being a foil to Dakota’s antics, I have unique insight into just how difficult Jonah Hill has it when he plays the straight man in a Russel Brand comedy. At one time or another Dakota has had me doing every exercise I swore I’d never do either because of how ridiculous I thought it looked or how grueling I knew it was. Awkward exercises are often invented on the fly: such as yard skiing in running shoes on rain-soaked grass, replete with a recumbent conclusion in full view of the neighbors. Predictably, every territorial marking opportunity is the scene of a new skirmish of the wills. The scent or sight of a field mouse, rabbit, deer or crow is the catalyst for a resource-exhausting tug of war that sometimes lasts minutes and may involve abrupt changes of course and unexpected climbs or plunges. Imagine performing cable flys, overhead cable extensions or bicep curls while simultaneously running forwards, sideways or backwards on a treadmill, and you may begin to appreciate the challenges of the Bad Dog Workout. And to think that I used to proclaim those masochistic runners who drag tires up hills crazy; at least they don’t sleep with their muddy exercise equipment. And just how does a bad dog usually get muddy? By insisting on it. How else? Try digging in your heels against the attraction of a furry-faced divining rod to its usually non-potable element (the slimier, the more attractive, evidently). You’ll be lucky if you are somehow able to sidestep the muck yourself. When Dakota has a mind to amp up my strength-training workout, he’ll stop dead in his tracks (and mine), and burrow for field mice, challenging me to forcefully exhume him using bicep curls or bent rows from the surprisingly large hole he has managed to dig in mere seconds. Forced (after several attempts) to disengage pursuing his subterranean squeaky-toy, Dakota will literally run circles around me in protest, offering in the bargain a rotator cuff workout that even the most rogue personal trainer would decline to endorse. Take it from me: love really does hurt. Oh, and with the Bad Dog Workout, there are hurdles–random hurdles–especially on single-track trail where one’s already narrow way is barred by a firmly planted fuzzy obstacle that definitely wasn’t there just a second before. The Dakota level of the Bad Dog Workout also includes evasive maneuver drills, as this bad dog is apt–with timing only he understands–to abruptly reverse direction and playfully deliver gut and groin punches. If I knew any videographers, I could post one of our runs on YouTube. It might even go viral and turn into the next extreme-fitness craze. Imagine thousands of extreme fitness enthusiasts trying to adopt half-wild Border Collies, Wolf Hybrids and Dalmatians just to get buff. As one who on certain days finds himself unequal to the Bad Dog Workout’s challenges, I recommend fostering a beagle before committing to the extreme fitness lifestyle. The Bad Dog Workout comes with a binding membership. A bad dog’s energy should never be cooped up indoors. A couple days without running and a bad dog is like a loaded spring. On snow days it spins in frustration and whines at the door. It goes out of its mind with smiling excitement when it sees running shoes, running attire and GPS watches. When it finally gets out the door, it’s even more difficult to handle than usual. After a layoff, there is no easing into a Bad Dog program. You will pay for your indolence. No workout partner or coach ever held you so accountable. In Bad Dog Workouts, it is always a good thing to let one’s right hand know what one’s left hand is doing, and vice versa. If one always employs the same hand for leash holding, one runs the risk of overdeveloping the leash-hand side of his or her body. Unless a Picasso-esque asymmetry is the look one is going for, they’d better change it up every mile. By ignoring this recommendation, one may also end up with arms that differ in length. While I say this jokingly, I wouldn’t be surprised to discover that it actually happens; it certainly feels like it could happen. Best not to chance it. And best to have two hands ready to take the leash at particularly demanding junctures. I can’t speak for all bad dogs, but Dakota at least is a big fan of the tempo run. Tempo runs happen whenever we round a corner to find ourselves behind a distant but visible (or olfactible) runner, mountain biker, hiker or walked dog. Like Achilles in Zeno’s Paradox, Dakota relentlessly seeks to reduce the distance between us and the “tortoise”, creating a labored frothing-at-the-mouth sound as he strains to pull along 140 lbs of weight that is usually insisting on a slower pace. It is tempting to think of the Bad Dog Workout as a multi-tasker ‘s dream. But be careful that the time you save combining cardio and strength training (and getting the dog out) doesn’t subsequently go down the drain in hour-long Epsom salt baths. If, after all of this, you think running with Dakota sounds difficult, you should try not running with him. Life’s not fair. I’ve said it before in these pages; and in my forgetfulness, I’m bound to repeat it. If anyone doubts the truth of it, they need only to consult the victims of the past two seasons’ wildfires for proof positive. Often reminded of this saying in our youth, we bear the world’s slings and arrows more or less philosophically, finding ample evidence of life’s unfairness before we’re old enough to drive. Then we find running (or it finds us). At first blush running seems to be a hermetically-sealed system of fairness and justice, a microcosm in which one gets just what one pays for, a place where hard work is commensurately rewarded, a matter-of-fact world of numbers, where popularity, wealth and connections count, refreshingly, for nothing. Here is a world that aspires to purity, where medals and awards are revoked in the cleansing light of anti-doping investigations. Even luck, we reason, can’t touch running; what runner ever lucks into running a 5-minute mile when the best she can physically run is a 6-minute mile? She might yet run a 5-minute mile, it’s true, but she’ll need time, massive training volume and familiarity with a track to do it (even if she possesses the requisite genetics). Here, we think, is a kind of Utopia built on just the sort of soil in which our Puritan work ethic can take hold and bear fruit.Alright, so we’re newbies. Soon enough we wake to the reality that not only is running really hard, but it’s just as freighted with inequities as the world at large. Former London Marathon director David Bedford once said that, “Running is a lot like life. Only 10 percent of it is exciting. 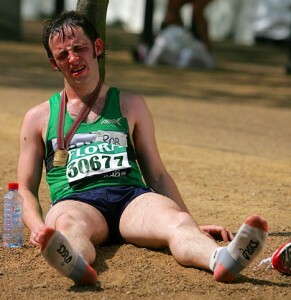 90 percent of it is slog and drudge.” Yes, running is indeed a lot like life; and life, we’ll remember, isn’t fair. Our first clue that we weren’t running in the land of milk and honey might have come with the realization that we don’t gain as much cruising the downhills as we lose slogging the uphills. Anyone descending a steep downhill knows that even a free fall comes at a cost. Similarly, we out-and-back runners are at first vexed to find that tailwinds do not aid us as much as headwinds hurt us. The same stiff breeze that robbed us of breath and energy on our way out lacks even the oomph to cool us on our way back. Later, as we take our running to remote destinations, we find that at lower altitudes we don’t gain that extra gear nearly as much as we are left sucking wind at higher altitudes. The veteran runner understands better than most that physics is a cruel mistress, and that entropy is a process from which one cannot run. But never let it be said that running doesn’t have a sense of humor. Running is quite the trickster, in fact. Coming off a winter of injury and motivational setbacks, we decide to run a test race under a self-deprecating and mock-Irish alias, just to “see what condition our condition is in.” And wouldn’t you know it, nobody else shows up, and we are mortified to be pressed by an ornery race director to accept our age-group medal as he announces—with a straight face—“Pokey McShuffles” or “Lurch O’Dawdles.” (This really has happened to friends of mine.) Conversely, a four-month stretch of text-book training leaves us feeling giddy about our chances of garnering our best-ever placing in a modest local race with predictable competition (i.e., where “Pokey McShuffles” is most likely not an alias). We arrive. And with the swagger of the one-eyed man in the kingdom of the blind, we step from our car just as a blur of singlets and racing flats zooms by at a six-minute per mile warm-up pace. Mouth agape, we’re left to wonder just when and how our quaint hometown race went viral with the who’s who of the Front Range racing set. Forget Irish aliases, we’ll need to borrow Shalane Flanagan’s cardiovascular system to be of consequence here. If we race long enough and seriously enough we’ll feel the sting of having left it all on a race course only to find that it was the wrong race course on which we—and the couple of veterans we prudently followed—left it. And we’ll have lost more than just the course: gone will be that series ranking we had all locked up after three hard-fought races, not to mention that cool trophy that had our name on it. Not only is Murphy (author of that accursed law) responsible for all this mayhem, he is apparently so fleet of foot that no runner can pull away from him—and if he did he’d trip on his own laces. Many of us have heard the morale-crushing stories of the runner who fought the good fight for 26.2 miles only to miss his Boston qualifying time by a scant few seconds—on something like his 8th attempt. Sadly, not all such stories are apocryphal. Outside of our running microcosm the letters DQ are likely to stimulate our taste receptors with halcyon memories of childhood and soft-serve goodness. In the running world, the letters DQ are synonymous with heartbreak. I for one know the unhappiness of having paced a runner who failed to make the 90-mile checkpoint of a 100-mile race. Imagine having just done something that only a relative handful of people on the planet can do—run 90 miles in a single shot—and having it not be enough. Ultra legend Scott Jurek once paced a friend to within hundreds of yards of winning a scrappy, grueling 100-mile race only to see him disqualified by Scott’s having given him a hand up after he’d collapsed with the finish line in sight. And of course there is the ultimate hard truth: if we train long enough, intensely enough and frequently enough, we’ll watch our returns diminish as our hard training turns to overtraining and injury. In running, as in life, the deck seems stacked against us. But at least when we run in search of our personal best, we all get to play against the same stacked deck. That sounds almost…fair.